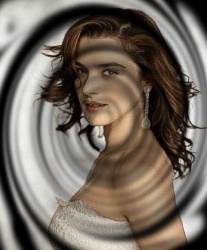 Rachel Hannah Weisz (pronounced /'re?t? ?l 'va?s/ "vice"; born 7 March 1970) is an English actress. She gained wide public recognition after her portrayal of Evelyn "Evy" Carnahan-O'Connell in the Hollywood films The Mummy and The Mummy Returns. In 2001, she starred opposite Hugh Grant in the hit About a Boy and continued to garner leading roles in Hollywood productions. Her performance in The Constant Gardener (2005) won her the Academy Award for Best Supporting Actress, along with other major motion picture awards. Weisz was born in Westminster, England, and grew up in the Hampstead Garden Suburb. Her mother, Edith Ruth (née Teich), is a Vienna-born Austrian teacher turned psychotherapist. Her father, George Weisz, is a Hungarian-born inventor whose family fled to England to escape Nazi persecution. Weisz's father is Ashkenazi Jewish and her mother has been referred to as either Catholic, Jewish, having Jewish ancestry, and being of part Italian descent. Weisz was raised in a cerebral Jewish household and refers to herself as Jewish. Weisz has a sister, Minnie Weisz, who is an artist. Weisz was educated at the independent North London Collegiate School. She later attended the independent Benenden School and then enrolled at the independent St Paul's Girls' School. She then entered Trinity Hall, Cambridge, where she graduated with a 2:1 in English. During her university years she appeared in various student productions, co-founding a student drama group called Cambridge Talking Tongues, which went on to win a Guardian Student Drama Award at the Edinburgh Festival for an improvised piece called Slight Possession.